Freitextfeld 1: Bissmünze durch David Blaine berühmt geworden. 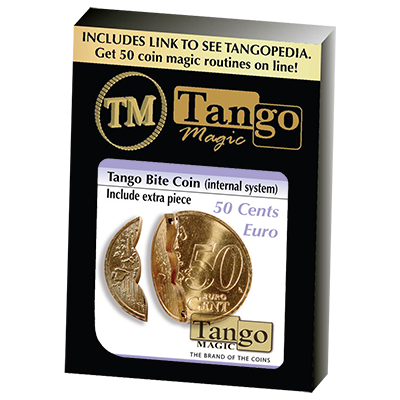 Produktinformationen "Bissmünze - Biting Coin - Euro 50 Cent (Internal With Extra Piece) | Zaubertrick"
The magician shows a coin, then he bites the coin and removes a piece of the coin, the coin is clearly shown to be missing a part. The magician then pulls the missing piece of the coin from his mouth. To finish the effect, the magician puts the piece back in his mouth and then blows on the coin and instantly the coin now looks to be whole again! Weiterführende Links zu "Bissmünze - Biting Coin - Euro 50 Cent (Internal With Extra Piece) | Zaubertrick"
Kundenbewertungen für "Bissmünze - Biting Coin - Euro 50 Cent (Internal With Extra Piece) | Zaubertrick"